When we looked at the social media landscape of healthcare CIOs, it could only be described as a ghost town. We found a grand total of six healthcare representatives among the 50 Most Social CIOs on Twitter. This was unfortunate, since the healthcare environment in particular could immensely benefit from social media communication and interaction. Social media can provide a means for better patient and community engagement; it offers a way to share information on topics like insurance and billing; it can help with staff recruiting and possibly even early diagnosis and treatment. 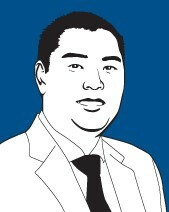 For an update on the current state of social media in healthcare, I spoke with David Chou, CIO of University of Mississippi Medical Center (UMMC). David is transforming healthcare by adopting social, mobile and cloud technologies. David started using social media years ago as a communication channel for connecting, on a personal level, with friends with whom he had lost touch over the years. Remember a time before Facebook? Back then, David had accounts with Friendster and Myspace to keep track of the friends he didn't see every day. "Then something called LinkedIn arrived," says David, "and it became the platform for connecting on a professional level with peers, counterparts, and senior leaders of an organization." LinkedIn took off when they began working with HR departments and it became an important repository for job postings. For David personally, LinkedIn quickly came to replace most other job websites like Careerbuilder and Monster.com, and at one time he even accepted a position from a LinkedIn recruiter. Now he will not consider any applicant that does not have a professional LinkedIn profile. YouTube, Vine, Instagram, and Twitter have also become part of David's everyday life. Twitter is where David shares his professional thoughts on the industry with his employees and peers throughout the world. Like nearly 10% of US adults, David gets his news from Twitter instead of the 6 o'clock news. UMMC is ramping up their usage of social media beginning with internal communication and branding. David is creating a department brand for external outreach and encouraging every employee to maintain a professional LinkedIn profile and Twitter account. The LinkedIn profiles help create a UMMC brand for attracting top talent nationally. This drive to post staff profiles on LinkedIn is not without risk, as it exposes staff members to poaching by other organizations. But by insuring that UMMC is a desirable place to work, the benefits outweigh these risks. Overall, the adoption rate of social media in David's department and organization is still a bit low at 25-35%, but the trajectory is upward. An incident occurred last month at UMMC that demonstrated to David how the organization could benefit from more proactive use of social media. At 2 am one night, UMMC had an Internet outage that lasted 4 hours. The outage caused more inconvenience than anticipated, because of a growing dependency of the medical center on Internet-based resources. The Internet access at UMMC is provided by a third party. Here is what David discovered during the outage. 1. UMMC did not have a backup Internet circuit on campus in case of a hosting partner failure. 2. UMMC departments had been moving to the cloud, making Internet access more important for providing patient treatment. For example, one hosted application enables the medical staff to check on diagnoses and certain complications, but cannot do so without Internet access. 3. Creative methods of communication are necessary during crises. Fortunately, UMMC avoided any negative impact on patient safety during the outage, but David wanted to notify the senior leadership via email about the issue and the actions taken to resolve it. Since their email was hosted in-house, all external inbound/outbound email communication was down. David was unable to communicate with the leadership team through Exchange or personal Gmail. David explains what happened, "I drove to work at 4:30 am to support the team and send out the email communication internally. At that hour, my brain was not fully functioning, because as any cognizant being would realize, email communication is meaningless while Internet connectivity is down. Instead, we went back to the traditional method of calling the team members one by one. I wanted to utilize social media, such as Twitter and Facebook to communicate, but had to hold off due to the still-low user adoption rate at the organization. Throughout the day and for weeks afterward, I felt that the social media platform would have been the best form of communication if we had a higher user adoption. My entire technology team and all employees would have been aware of the outage if we had been able to use social media." David has now taken steps so that the next time an incident occurs, UMMC will be ready to use social media as a back-up for their communication, just as Boston did when the marathon tragedy struck and the local cell towers were jammed. The country may have had different outcomes during earlier natural disasters like hurricane Katrina if social media had been utilized at that time to communicate to the community. The University of Mississippi Medical Center is the second largest employer in Mississippi, so David's social media activities can be expected to have impact beyond the walls of UMMC. A teaming arrangement with Alabama and Louisiana is also encouraging collaboration across state lines, and of course, Twitter provides David's team with the ability to collaborate worldwide. We welcome you to join in! Let us hear your thoughts on social media in healthcare. And please introduce us to healthcare CIOs who should be included in our next list of The 50 Most Social CIOs on Twitter. This post was co-authored by David Chou, CIO of University of Mississippi Medical Center. David has appeared on CXOTalk, a live webcast with thought leaders and innovative executives pushing the boundaries of digital transformation. You may view David's CXOtalk appearance here.